Diamonds were a hallmark of the furniture-maker Aslak Olsen Lie (pronounced LEE), appearing across the many styles of his work. Lie was born in Norway and spent the first thirty years of his career there. When he emigrated, he brought with him the skills and thinking of a mature craftsman. Lie’s family was one of the first Norwegian families to settle in the Blue Mounds region. He quickly adapted to making both American and Norwegian styles of furniture. The Norwegian cut-out ends on this stepback cupboard show how Lie would also mix those styles. The result was furniture that is distinctly Norwegian-American. Compare the unusual interior decoration of this cupboard with that of the traveling box in the previous area of this exhibit. 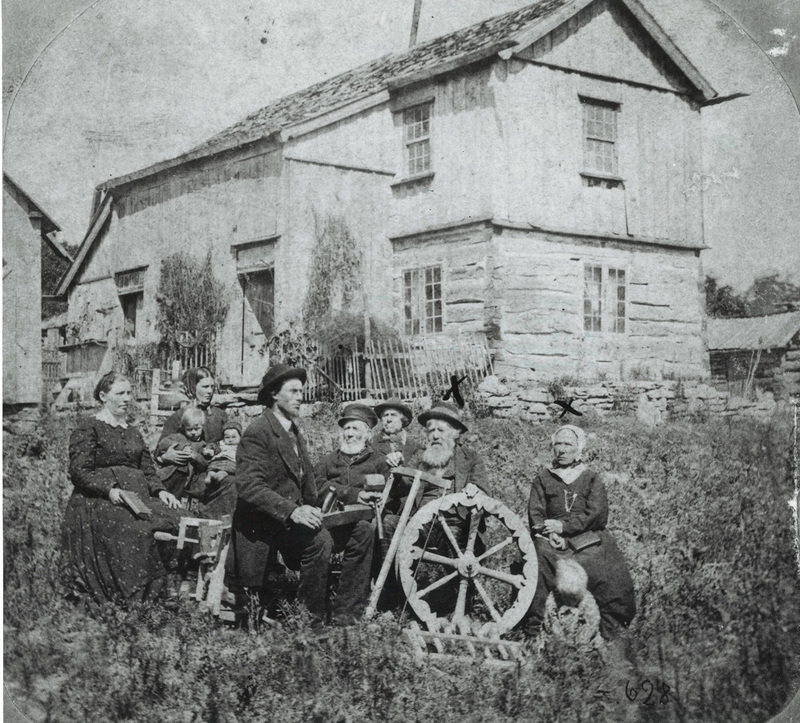 Aslak Olsen Lie (second adult from right) poses with family members in front of the home he built with his brother after immigrating from Norway in 1848. WISCONSIN HISTORICAL SOCIETY, WHS-27635. In an advertisement he took out in a Blue Mounds area newspaper, Norwegian immigrant Aslak Olsen Lie (pronounced LEE) promoted his cabinetmaking business on his ability to make furniture according to American and European fashions. But while the advertisement seems to suggest that Lie alternated between working in one style or the other, the reality is more complicated. Examination of Lie’s post-emigration furniture shows that he regularly mixed forms and stylistic elements from his native Norway with those popular in the United States. 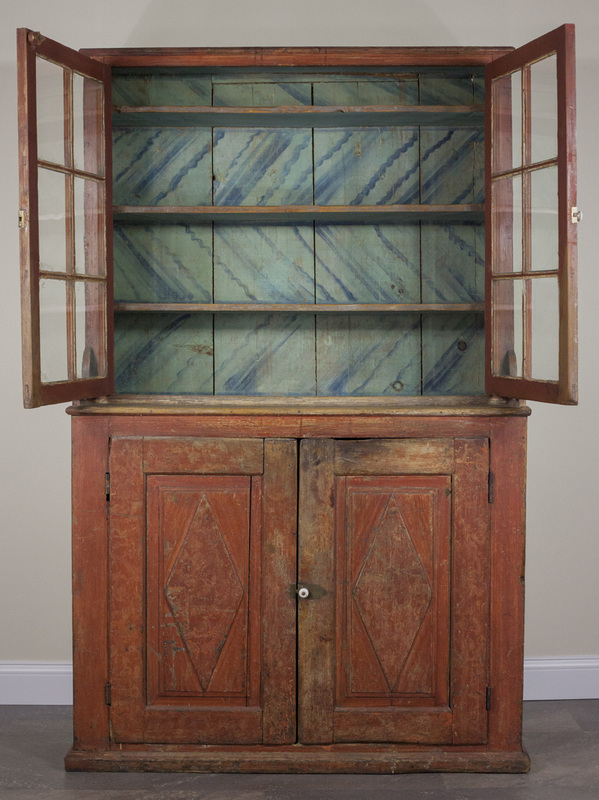 The stepback cupboard that he made around 1860 for the Skindrud family is one example of such blending. Considering this piece within the greater context of his life and career sheds light on Lie’s own formation of immigrant identity. Aslak Olsen Lie’s career as a cabinetmaker spanned over six decades and straddled the Atlantic Ocean. Lie was born in the Valdres district of south-central Norway in 1798. As a young man in Norway, Lie learned the techniques involved in making furniture and developed an aesthetic sense for Norwegian design. As a cabinetmaker in rural Norway, he developed his own variations within the decorative traditions of that culture. A fifty-year old man when he emigrated in 1848, Lie came to Wisconsin an already mature craftsman. His family was among the first from Norway to settle in the Blue Mounds area and was a central figure in establishing a stream of immigrants from Valdres to Blue Mounds. In Wisconsin, Lie had to both adapt to the tastes of his new, American, clientele, as well as continue to appeal to other Norwegian immigrants. Lie’s resultant work varied based upon the taste of each client, bearing more characteristic of one style or the other. However, the majority of Lie’s work in Wisconsin shows some degree of hybridization – the synthesizing of the two influences to create a distinctly Norwegian-American style of furniture. The stepback cupboard made for the Skindrud family displays characteristics of Lie’s hybrid styles in his work in Wisconsin. Stepback cupboards are an American form that have a shallow upper casement that “steps back” to produce a shelf where the deeper base juts out. Cupboards of this form, particularly those with glass upper casement doors, often emphasize straight lines and angularity. In contrast to this American form, the cupboards Lie made while in Norway were dominated by the use of dramatic curving ornamentation. In the Skindrud cupboard, Lie flanked the shelf with scrollwork ends. In doing so, he incorporated Norwegian curvilinear design into the angular American form. Additionally, the red exterior and patterned blue paint inside the cupboard draw upon the Norwegian tradition of decorating furniture with bold colors. Aslak Lie’s hybridization of furniture styles reveals an active formation of immigrant identity. Lie created new designs out of elements he knew from both Norway and America. He was still able to show creative self-expression through his cabinetry. When designing a piece of furniture, Lie knowingly selected what he wanted to take and incorporate from Norwegian and American decorative traditions. In form and style, Aslak Olsen Lie’s post-immigration works display a great variation as he interpreted his neighbors’ and his own ethnic identity. As a case study, Aslak Lie demonstrates how the process of acculturation and hybridization among first generation immigrants is an active process. Lie consciously shaped and used ethnic character to navigate his new market. By so doing, he pushed his own artistic boundaries, as well as both Norwegian and American furniture to new forms. Bakken, Reidar. Snikkaren Aslak Olsen Lie: Bygdekunstnar i Valdres og Wisconsin 1798-1886, Craftsman on two Continents. Oslo: Novus forlag, 2000.